Process Monitor displays both file system and registry activities in real-time, combining the features of FileMon and RegMon. Additional features includes live changes (autoscroll), non-destructive filtering, comprehensive event properties such session IDs and user names, reliable process information, full thread stacks with integrated symbol support for each operation, file logging etc. 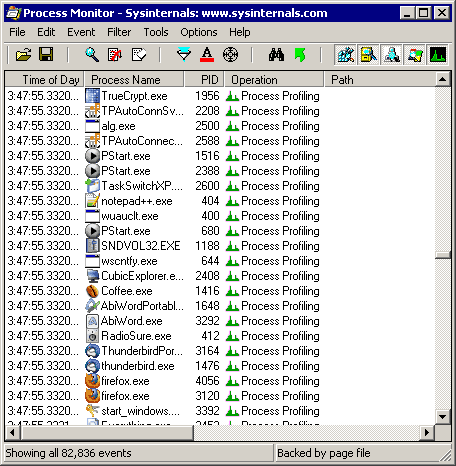 Alternatively, Process Monitor Portable is also available, which is stealth. @ __philippe do you know is there gonna be any effort made to correct this? I'm kinda surprised cuz I have always thought of SysInternals as being a first rate top notch entity, but they are not showing that in this case.Even if the changelogs are only interesting or necessary to a few people in my opinion that reason enough to continue with accurate data. Annoyingly, SysInternals' powers-that-be no longer deem worth their while to provide a changelog of their recent releases. (e.g. Procmon v3.30 fails under winXP, despite the "Process Monitor runs on Windows XP SP2"
- fixes a bug that prevented boot capture on Windows 10.
shodan816: plz post in forums the registry settings in question. Thnx. I would really like to know why this is considered 'PORTABLE freeware' when it writes it's settings to the system registry. Anyone?! On Vista Home Premium, it runs out of memory... can't allocate a memory block of 459893316; closing the error closes the program. This shouldn't be happening. Installs a driver and writes it's settings in the registry. Not portable by my standards. Quite a few times Windows XP has crashed/restarted after using new sysinternals software. Maybe it's an incompatibility with older software that has been used, I'll never know, What I do know is I will stick to the older releases. Process Explorer is indispensable. It seems that this warning will continue to nag you upon launch unless you actually install the debugging tools which you may never otherwise use. Very irritating. This version of Dbghelp.dll configured does not support the Microsoft Symbol Server. Please download and install the Microsoft Debugging Tools for Windows to get a version that does." Very competent C3P0 to help you in your faultfinding efforts. For example: What makes the CPU to run at near top speed when I believe the machine to be idle? Iip: By clicking one of the big icons. top right, you get a graph showing the last half minute´s activities when the cursor is left on the window. It also runs an icon in the quick tray showing angry colours when CPU is over-heating. Perfect companion to SysInternals´ "Autoruns". :-) !! An essential must for lap-top users for help in conserving power. Easy to learn, both programs. Requires XP SP2! Darn! Doesn't run on XP SP1.